I've downloaded from the two available links and extracted on two different Macs the Zip file with the same result multiple times. I get a folder with components instead of a application file. Is there a way to make this a application file rather that the folder. You know, as when you <right click> and "show package contents". That's basically what I'm getting, the package contents rather than an executable file. I'm sorry but installation file which creates desktop icon is available only for Windows. It was impossible to create similar file for Mac (for some reason). 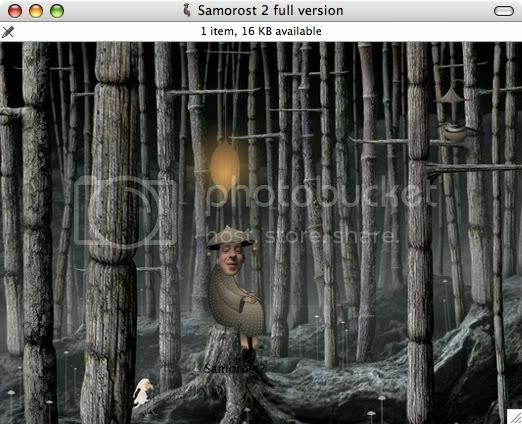 However if you just unpack the folder to your hard disk and launch the game by samorost2.html file it will run in your web browser like the web demo version and without any installation. Sorry to bump this topic, but I thought my post would be relevant to this specific thread. And, I'm really looking forward to the release of Machinarium; it looks awesome. and I liked them so much that I also purchased the full version for Mac..
however I was bit surprised why the packaging was done just as a flat directory structure..
just for fun I wrapped the existing structure into OS X standard application bundle and so on..
JD, any possibility for this version be released, for those who have already purchase the game? Id love to be able to run the game from my dock and dont need to use safari for it. Id love to be able to run the game from my dock and dont need to use safari for it. Just thought I would post to clarify that this is not a true standalone solution in that it still requires you to play the game through your default Web browser, i.e., double-clicking the application merely launches your default browser, and you will be running the game via that browser, although you do not have to be online.